The sun peaked through the clouds and our drive down to Valdez was very nice. We could almost see the Wrangell Mountains in the distance. Stopped by the Worthington Glacier Viewpoint and walked down to the overlook. Not as pretty as the Mendenhall in Juneau but still scenic. At the top of Thompson Pass, the fog came in and we could barely see the highway, let alone any mountain vistas. No wonder the Milepost says "Good Views, weather permitting." Closer to Valdez, we entered the Keystone Canyon with it's seemingly endless waterfalls. 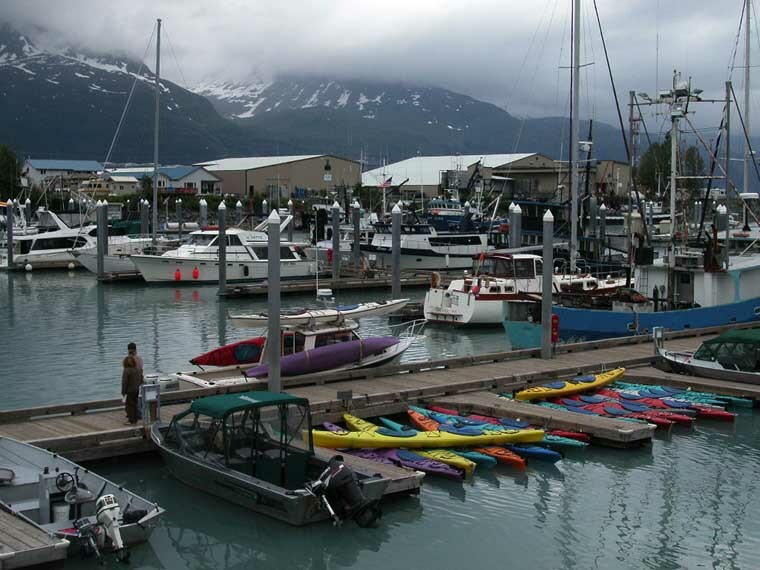 Our campground spot in Valdez was right on Prince William Sound. What a spectacular spot. From our front windows we had a 180 degree view of glacier covered peaks. We watched oil tankers loading up at the pipeline terminal across the sound and fishing trawlers unloading their catches into larger holding ships. Best of all, we watched sea otters and harbor seals playing in the water right in front of us. Unfortunately, the mountains were often covered in clouds as it rained most of the time we were in Valdez. Evidently this is not uncommon as we were told they get less than a month of sunny days per year! And in winter the average snowfall is almost 30 feet. 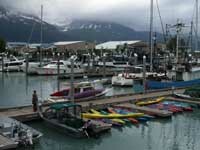 Our second day in Valdez, the rain stopped and there was blue sky so we did a little sight-seeing. Drove up a dirt road along Mineral Creek. The hillsides were covered with lush green vegetation - reminded us of Kuai. Again, lots of waterfalls, visible closeup and all along the mountain range. Hoping that the weather would hold, we decided to sign up for some type of boat tour. 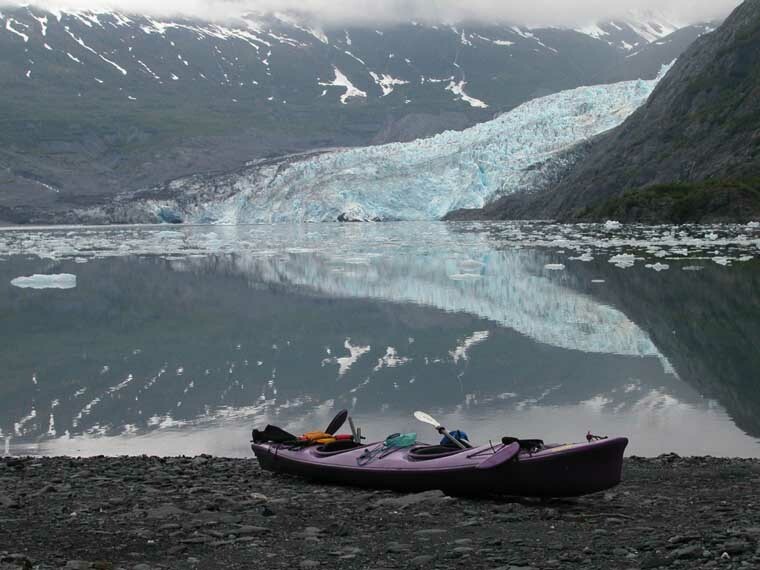 Since we had all taken the boat to the Columbia Glacier when we were here on a cruise, we decided to try something different - a kayaking trip to Shoup Glacier. Now none of us had ever been in a kayak before. But the ad said this trip was designed for beginners. 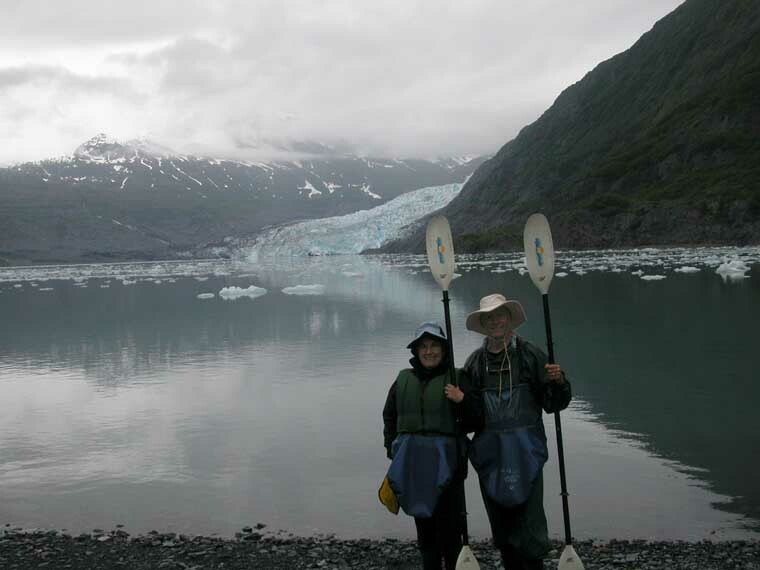 And the guides assured us the two person sea kayaks were very stable - highly unlikely we would tip over. So we made our reservations for the next day and went home to prepare. When we woke up the next day, much to our dismay the fog had come in and we couldn't even see across the sound. 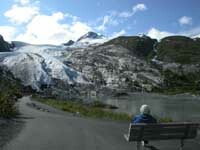 But the tour company assured us it would be much clearer at the glacier, and besides, cloudy days make for better pictures of the glacier. So we began donning the gear - rubber boots, rain pants and jackets, something called a splash skirt that looked like a giant rubber diaper, and a life vest. This on top of three layers of our own clothing! We put cameras and binoculars in one dry bag, a change of clothes in another, just in case. And our lunch in plastic bags. They handed us our paddles, gave us a few minutes of instruction on how to hold them and paddle, and what to do if the kayak tips over (even though that is highly unlikely, right?) Then they showed us how to get in and out of the kayak. This is when I almost asked for my money back. To get in, you sit on top, swing your legs into the hole, lift your body over the back of the seat and slide forward onto the seat. To get out you do the reverse, again using your very strong arm muscles to push your featherweight body up and out of the seat. All without tipping the boat. My first attempt on land, I ended up flat on my back on top of the kayak and needed help to get up. Felt like a beached whale - must have been all that extra gear we were wearing. What was going to happen on the water? Then we were off to the dock to board our water taxi that would take us to our put in point - about a 30 minute ride away. There were 5 of us plus a guide in 3 kayaks. Once there, they lowered the kayaks over the side and told us it was time to get in. Thankfully, they held the kayak nice and steady and it was actually easier getting in off the boat than on land. 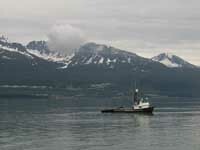 We waved goodbye to our lifeboat, and we were off to see the glacier. After a few dips of the paddle, we rounded a bend and there it was. I began to think this was going to be worth doing. 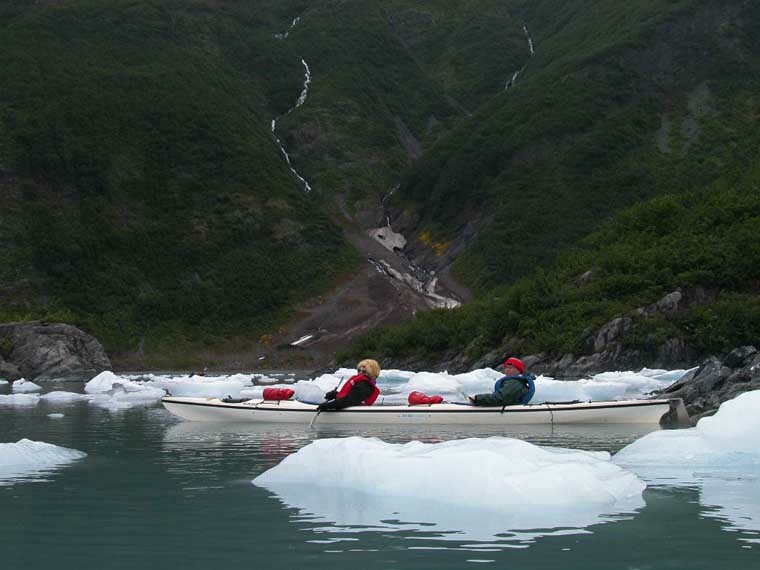 Except when Fred was rummaging around in the back seat for his camera, the kayak was actually pretty stable feeling. And it wasn't difficult to paddle. The bay we were in was very calm.The tricky part was steering around all the ice bergs in our path. But they also made for spectacular scenery. 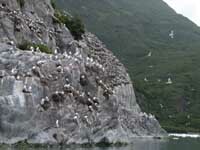 On the way in, we paddled along some rocky cliffs that held over 18,000 nesting black legged kittawakes. Each spring they come back to this spot to build nests, lay their eggs and hatch their babies. 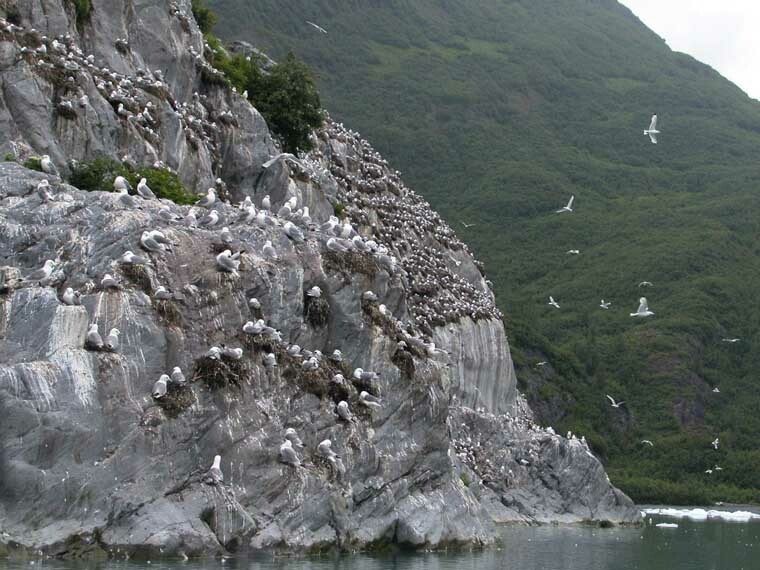 It was an amazing site to see all those birds on their nests, perched on icebergs and flying around. And at one point, a falcon flew too close to the nesting area and all the birds took to the air at once. What a site and racket! We were just getting the hang of things and starting to feel comfortable when the guide said it was time for lunch. He directed us to a spot along the shore where we beached the boats. Time to do the "get out" thing again. With a little bit of leverage from the guide, this time I made it without falling backwards. Our lunch spot faced the glacier and it looked so close we started taking lots of pictures, only to be told we were still 3 miles away and we would be paddling to within 20 yards of it! Oh my. Lunch over, we got back in (now I was beginning to feel like a pro), and away we went along the cliffs where beautiful waterfalls cascaded down into the bay. All along, we kept hearing the sound of the glacier popping and calving but so far we hadn't seen a calve. 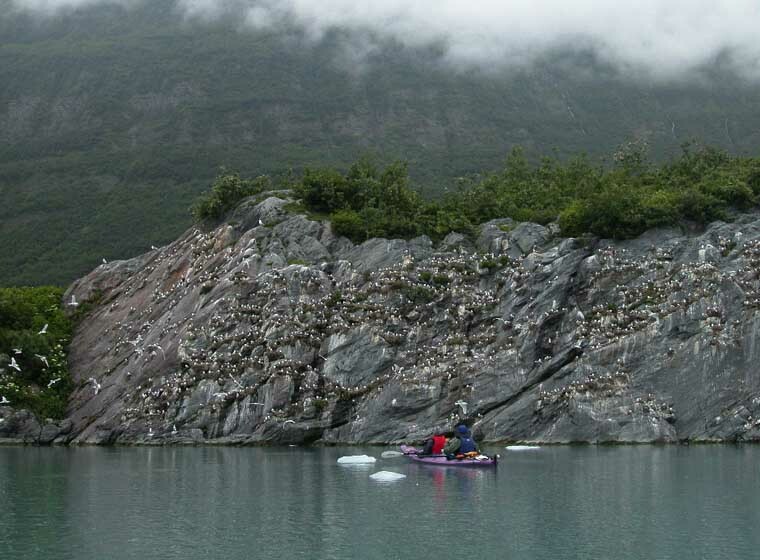 We were told that if a big enough piece broke off it could cause a huge wave that could swamp and tip the kayaks. Just what I wanted to hear. But I still wanted to see a calve.We finally got close enough and took more photos. Meanwhile the sound was awesome - like crashes of thunder. 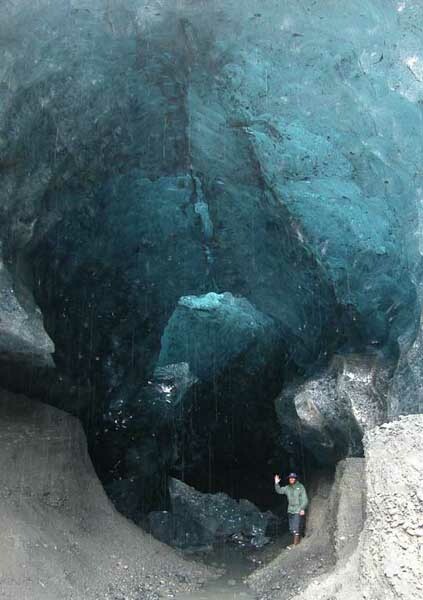 And they were right, because it was an overcast day, the glacier looked extra blue. Once again we beached the boats and the guide led us for a walk on the glacier. This part of the glacier looked just like a mound of dirt but underneath was all ice. 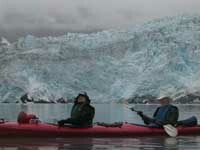 The guide led us up and over the glacier to an ice cave that had just developed the week before. I felt like I was on another planet. And we finally did get to see the glacier calve. Fortunately it wasn't big enough to swamp the boats. All too soon it was time to begin the long paddle back. We had taken our time coming in, with lots of stops. Going back was pretty much non-stop and the muscles began to make themselves known. Our water taxi picked us up and we were back to the docks in no time. The whole trip was 8.5 hours, with about 6 of that in the kayaks. It was an unbelievable experience and I would do it again in an instant. . I'm sure it will be the highlight of our trip to Alaska. My arms really ached that evening but the next day there was only a little tightness in the muscles. Well this got to be longer than expected so I'll save the rest of Valdez till the next newsletter.